This is the first article in a new series of profiles on members of the ARM User Executive Committee (UEC). Editor’s note: Aiken was named the vice-chair of the UEC. She will serve in the role for the next two years before becoming the chair of the committee. Allison C. Aiken brings her innovative aerosol chemistry background and eight years of ARM data experience to the User Executive Committee. Photos are from ARM and Aiken. While still a graduate student, Allison C. Aiken—now an aerosol scientist at Los Alamos National Laboratory (LANL) in New Mexico—developed a new analysis technique for organic species found in the atmospheric particles she studies. In 2014, she was named one of the world’s most influential scientific minds by Thomson Reuters. Today, Aiken’s work has drawn more than 8,000 citations, and she is among the top 1 percent in her field for highly cited first-author papers. These facts and others helped place Aiken among the newest members of the User Executive Committee, an advisory group within the U.S. Department of Energy’s (DOE) Atmospheric Radiation Measurement (ARM) user facility. Another ARM connection: Aiken is a member of the user facility’s Aerosol Measurement Science Group. 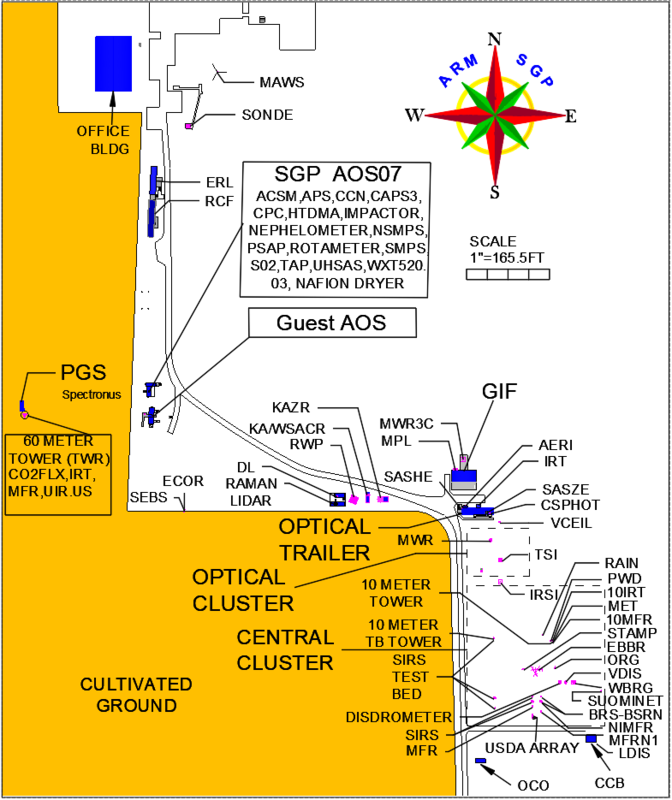 The group coordinates ARM’s aerosol and trace gas observations with user needs to ensure high-quality observational measurements and data products. Her research shows a touch of the polymath. In addition to committee and mentoring work (“I got the “advising-teaching-mentoring gene,” she says), Aiken has investigated optimal particle beam widths, chemically specific particle removal techniques, and aerosols from cities, pristine mountain regions, North Atlantic marine clouds, wildfires, burning meat, and even high explosives. At LANL, Aiken’s work sometimes touches on the national defense implications of air quality. DOE, she says, is interested in “everything that would produce aerosols and gas-phase emissions,” as a way of predicting atmospheric changes that affect the nation. By her fourth year at Trinity Preparatory School in suburban Orlando, Aiken had already been in love with chemistry for at least four years. Today, part of being maxed out for Aiken is performing first-class science in aerosol chemical composition, optical properties, and—an early attraction—aerosol mass spectrometry. At the same time, she is grappling with motherhood. Her daughter, Alisha, is 6 months old. Yes, for now, Aiken has traded paddleboarding for changing diapers and getting too little sleep. During a visit to Furman University, her undergraduate alma mater, Aiken mugs for the camera by a wall in the chemistry department. The group photo shows mentor Tony Arrington posing with her and other Furman students in Los Alamos, New Mexico, in 2000 during her first summer internship at LANL. Aiken grew up in Winter Park, Florida. Her parents say she wanted to be a scientist as a toddler, but she only remembers a later inspiring moment, in sixth grade: being bowled over by the idea of electrons and molecules. She entered Furman University in Greenville, South Carolina, in 1998, fully intending to be a chemistry major but not sure where that would lead. Arrington, now retired, also steered his young new student and others to summer work at Los Alamos National Laboratory—where Aiken, at age 20, joined a team working on an in-house, custom-built mass spectrometer. Among other things, Aiken recognized in herself a facility with hardware. “I would credit that to engineering being on both sides of my family,” she says of a profession followed by her maternal grandfather, her father, her brother, and her husband, Andrew Schmalzer, a PhD engineer who is an expert in developing next-generation materials. “I can’t escape it,” says Aiken, with a laugh. Her paternal grandfather, a career U.S. Army chemist, was also an inspiration. From left to right, Aiken and LANL colleagues Juarez Viegas, Vagner Castro, and Heath Powers stand on an ARM Mobile Facility platform during the GoAmazon2014/15 field campaign in Brazil. Today, Aiken is the only scientist working jointly on two LANL teams related to instruments and associated experimental techniques: Field Instrument Deployments and Operations (FIDO), which primarily supports ARM, and Atmosphere, Climate, and Ecosystem Science (ACES). In 2017, Aiken was elected to chair the American Association for Aerosol Research (AAAR) Instrumentation Working Group. Back in 1999, a mentor at Los Alamos, Steven Buelow, now at the New Mexico Consortium, and also a Harvard PhD, introduced Aiken to what was then “the exciting new field of aerosol chemistry,” she says. Aiken’s graduate studies at CU Boulder (PhD, analytical chemistry, 2008) reached fruition in a dissertation on the elemental particle analysis method that earned her early peer recognition and, later, the Thomson Reuters accolade. While getting there, however, Aiken leapt eagerly into the business of science field campaigns—a demanding laboratory of reality that she says is important for understanding key atmospheric processes that require in-depth and controlled study in the laboratory back home. Graduate-level field work was a natural progression for her. As a freshman in college, Aiken studied water chemistry by collecting water samples in the field then analyzing them in the laboratory. “My love of field work and appreciation for it developed in undergraduate school,” says Aiken, who also studied butterflies in the Amazon rainforest during college field research in ecology. Loving field work is paired with “my love and wonder at the natural world and how small changes can perturb large systems and cause unforeseen feedbacks—essentially the butterfly effect,” says Aiken. Aiken also loves developing new instruments and measurement techniques for the laboratory setting. At Storm Peak Laboratory in 2004, Aiken works on an early version of the aerosol mass spectrometer that had just been compromised by snow seeping through the door behind her. During the first winter of her graduate career, Aiken joined a team of scientists at Storm Peak Laboratory, a mountaintop atmospheric research facility in Steamboat Springs, Colorado. “Storm Peak was exciting right away—exciting and crazy,” says Aiken. On the first night, the team stayed up until sunrise working on instruments that had some calibration issues. While they slept for just a few hours, blowing snow seeped through a garage door, shorting out some of the boards in an aerosol mass spectrometer that had been collecting real-time data. More important, however, Aiken awoke to “the excitement of collecting data in real time from the field,” instead of collecting offline samples and bringing them back to a lab for analysis. In the years since, with considerable joy, Aiken has been part of field campaigns in the Amazon, the Azores, and Mexico. ARM sponsored many of them, including Observations and Modeling of the Green Ocean Amazon (GoAmazon2014/15), Layered Atlantic Smoke Interactions with Clouds (LASIC) in 2016 and 2017, and Aerosol and Cloud Experiments in the Eastern North Atlantic (ACE-ENA) in 2017 and 2018. Aiken’s dissertation, however, drew heavily on the data set from an aerosols and trace gases campaign she was part of in 2006 in Mexico City, the Megacity Initiative: Local and Global Research Observations (MILAGRO). The campaign, funded by the National Science Foundation to investigate atmospheric chemistry in a large urbanized region, was “one of the first where we were able to see so much SOA (secondary organic aerosol) formation in the course of a day, or even hours,” says Aiken. Data that refined were possible, in part, because of “one of the newest things going on at the time,” says Aiken: capturing ambient organic aerosol data with high-resolution time-of-flight aerosol mass spectrometry. Data from MILAGRO yielded papers for her at least through 2012. Aiken works in her lab at Los Alamos. From a family of engineers, she is drawn to the instruments central to her research. After getting her PhD, Aiken moved to a series of posts in the Earth and Environmental Sciences directorate at LANL: postdoctoral research associate (2010), the Directors Postdoctoral Fellow (2011−2013), research scientist (late 2013), and research scientist III (2018). As her career continues to evolve, Aiken still has the enthusiasm of that Florida sixth-grader wowed by electrons. And she still has the sense of wonder she felt when as a 12-year-old on winter vacation in Steamboat Springs. One day, Aiken skied past the humble snowed-in trailer that housed early versions of Storm Peak Laboratory. ARM is a DOE Office of Science user facility operated by nine DOE national laboratories, including Los Alamos National Laboratory.